Above: Iris Meredith in a publicity still for the 1939 Columbia B-film Those High Grey Walls. B-western and chapterplay heroine Iris Meredith was not only exceptionally lovely, but was also a subtly expressive actress who could convey a range of emotions with a mere look or a single soft-spoken line of dialogue. Her delicate, graceful beauty made her seem unusually refined, almost aristocratic, when compared to other serial actresses, but her gracious and natural friendliness removed any hint of aloofness or hauteur from her characterizations. Unlike Republic Pictures, Columbia Pictures rarely featured the same heroine in more than one serial, and never promoted its actresses as “serial queens.” But the Columbia cliffhangers definitely had an uncrowned queen in the person of Iris Meredith. Iris Meredith was born Iris Shunn in Sioux City, Iowa. Her parents were poor and moved several times in pursuit of work during Iris’s childhood. By the mid-1920s, the family had reached California; by 1928, both of Iris’ parents had died, and she went to work in her early teens to support her younger siblings. She was spotted by a talent scout while working as a cashier at Loew’s Theatre, and she began appearing in films around 1932. She worked as a chorus member in some MGM films like Roman Scandals, and played various bit roles in other films. Her first credited part was in The Cowboy Star (Columbia, 1936), a semi-comedic B-western in which she played the heroine opposite Charles Starrett. After co-starring in a few B-westerns for independent studios like Supreme, she signed a contract with Columbia in 1937, and spent most of her remaining career co-starring in the studio’s Charles Starrett and Bill Elliott B-westerns. During her stint at Columbia, she also was featured in three of the studio’s chapterplays, beginning with The Spider’s Web in 1938. The Spider’s Web was the first and also the best of Iris Meredith’s serials; its fierce action, respectably large budget, and strong cast made it one of Columbia’s biggest cliffhanger hits. Based on a popular pulp magazine series, Web starred Warren Hull as Richard Wentworth, an aristocratic millionaire who battled a master criminal called “the Octopus” while disguised as “the Spider.” This masked vigilante was feared by criminals and hunted by the police, and only a small group knew his real identity– his best friend Jackson (Richard Fiske), his valet Ram Singh (Kenne Duncan), and his fiancee Nita Van Sloan (Iris Meredith). Meredith brought an ideal combination of upper-crust polish and plucky courage to her role, and made a perfect screen partner for the tough but suave Warren Hull. Spider’s Web remains one of Columbia’s most popular serials, and Iris’s Nita Van Sloan remains easily her most famous serial characterization. Above: Iris Meredith and Warren Hull in a publicity still for The Spider’s Web(Columbia, 1938). Above: The masked Spider (Warren Hull) and Nita Van Sloan (Iris Meredith) confront the (offscreen) Octopus in the final chapter of The Spider’s Web. 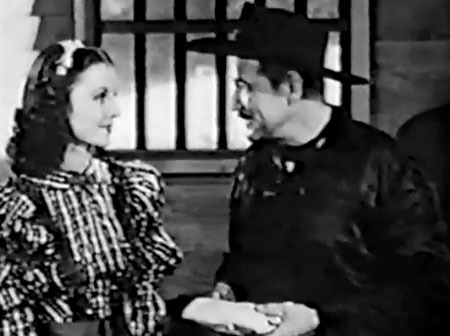 In 1939, Meredith teamed with her frequent B-western co-star, William “Wild Bill” Elliott, for her second cliffhanger, Overland With Kit Carson. This Western serial was filmed on an enormous scale unusual for a cliffhanger, much of it being shot on location in the wilds of Utah. Elliott, as legendary frontiersman Kit Carson, was assigned by the US Government to thwart the schemes of a mysterious outlaw called Pegleg, who was planning to build an empire west of the Rocky Mountains and was using a following of outlaws and Indians to drive pioneers from the unsettled territory. Iris played Carmelita Gonzalez, the adopted daughter of a Spanish ranchero, who aided Carson in his fight against Pegleg throughout the serial. Though Meredith, along with the rest of the excellent cast, was somewhat thrown into the background by the serial’s large-scale action scenes and imposing locations, she was splendid as Carmelita. She gave the character a touch of friendly wit and an air of elegance befitting the child of a Spanish grandee, and retained said wit and elegance even when assisting Elliott’s character in numerous gun battles. Above: Iris Meredith and Jack Rockwell in Overland With Kit Carson (Columbia, 1939). Above: Iris Meredith and Bill Elliott are rescued by friendly Indian Iron Eyes Cody in Overland With Kit Carson. Meredith’s final serial was The Green Archer (Columbia, 1940). This chapterplay, a loose adaptation of a Edgar Wallace novel, dealt with a society jewel thief named Abel Bellamy (James Craven), who framed his brother for his crimes, took over the family castle and turned it into a front for his criminal activities, and imprisoned his brother’s wife (Dorothy Fay) to keep her from exposing him. Insurance investigator Spike Holland (Victor Jory) and the imprisoned wife’s sister Valerie Howett (Iris Meredith) attempted to unmask Bellamy’s villainy with the help of a mysterious figure called the Green Archer. Thanks to the comic predilections of its director James Horne, Green Archer’s plot was quickly lost in a sea of comically exaggerated performances and wild fist-swinging brawls, which turned the serial into a near self-parody of the cliffhanger genre. Iris delivered another fine performance, admirably “playing it straight” in the midst of overacting and displaying some believable worry over her character’s missing sister. Along with co-star Victor Jory, she managed to avoid being overwhelmed by the serial’s frantic pace and rambling script, but the two leads’ earnest performances were rather overshadowed by the wild antics of the other cast members, especially Craven as the semi-hysterical villain and Fred Kelsey as a blustering cop. Above: Valerie Howett (Iris Meredith) receives an unexpected phone call from her missing sister in The Green Archer (Columbia, 1940). Above: Iris Meredith and Victor Jory in a publicity still for The Green Archer. Iris concluded her time as a Columbia contract player with the 1941 Bill Elliott B-western Son of Davy Crockett. Sometime in the early 1940s, she married Columbia director Abby Berlin, a fellow-inhabitant of the Columbia B-movie unit who directed many of the studio’s Blondie and Dagwood comedies. She only made a few more movies before retiring from the screen in 1943; her last film role was the female lead in the Buster Crabbe B-western The Kid Rides Again (PRC, 1943). In 1965, her husband died, and a few years later she developed a serious case of facial cancer. Despite her illness, she made a public appearance at the Nashville Western Film Festival in 1976, attending a screening of The Spider’s Web and receiving a standing ovation from the assembled fans, who were shocked by her poor health but moved by her courage and her kindness in attending. She passed away in 1980. During her brief but productive career in Columbia’s B-film unit, Iris Meredith captivated the matinee audiences of the 1930s and 1940s, and has held a deservedly high place in the affections of B-western and serial fans ever since. The same courage and graciousness that brought her to Nashville in 1976 shone through her earlier screen characterizations; these traits, together with her delicate beauty, made her one of the most unforgettable cliffhanger heroines. Above: A publicity photo of Iris Meredith from one of her Columbia B-westerns. Acknowledgements: I am indebted to pulp magazine expert and movie scholar Ed Hulse, who interviewed Iris Meredith at the above-mentioned 1976 Western Film Festival, for much of the biographical information in this article and for the account of Meredith’s visit to Nashville. Ed’s article on his interview with Iris can be found in the Summer 2006 article of his magazine Blood ’n’ Thunder. I think Iris was very underrated in her acting ability. If you watch the Charles Starrett movie “Cowboy Star”, you will notice the different emotions that she shows in different situations. I never noticed that until recently, when I was watching the movies again. She was also one of the most beautiful leading ladies of all movies. Lovely to see my grandmother ,miss here always.